A few years ago, Georgia Tech professor Gil Weinberg heard from local drummer Jason Barnes, who had lost his right arm after being electrocuted but wanted to play drums again. So Weinberg’s team built a prosthesis that could hold not just one drumstick but two. Afterward Barnes became an overnight sensation as one of the world’s fastest drummers. Weinberg then wondered, “Why not everyone?” Enter the brand-new “smart” arm, a two-foot-long artificial appendage that attaches to a drummer’s shoulder. Drum machine, meet your match. Weinberg’s team wrote a code to process what the robotic arm senses. A series of algorithms controls where it moves, how fast it plays, and when it reacts to the drummer. 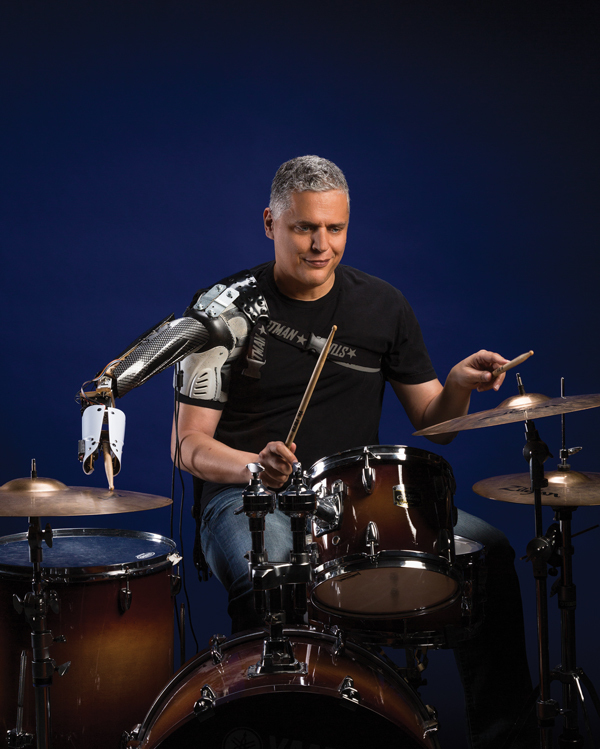 Based on a drummer’s movements, the robotic arm can play different parts of the kit. Focused on the hi-hat? It’ll play the ride cymbal. Playing the high tom? It’ll cover the floor tom. The third arm isn’t just smart; it’s fast. The world record speed is 1,208 strokes per minute. The new arm can sustain close to that speed for as many encores as needed. Through an algorithm, the robot listens to what the drummer is playing and responds accordingly. “If you play a sophisticated rhythm, it can answer you,” Weinberg says. Weinberg wants the arm to react to a drummer’s thoughts. His team is now researching how to make the robotic limb respond to a percussionist’s brainwaves through an electroencephalogram (EEG) headband.